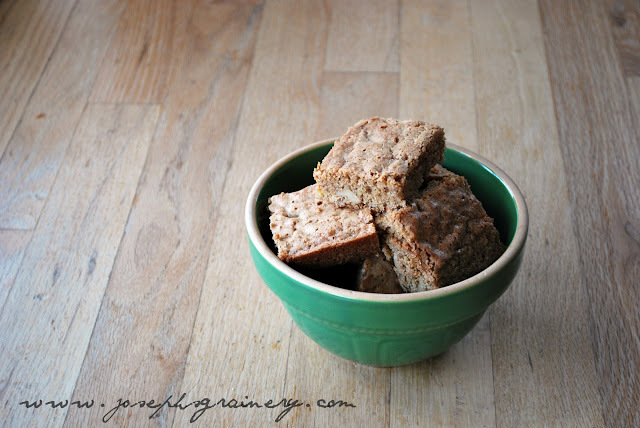 MaMa laughs every time I call these Whole Wheat Blondie Bars "brownies". That's what they remind me of, minus the chocolate of course. This is a "brownie" my Grandpa would really like...too bad I just ate the last one. I'm still learning to share. Directions: Preheat your oven to 350 degrees. Prepare a 9x13 pan with cooking spray. In a microwave safe bowl, melt the butter. In the bowl of your mixer, cream together the butter and sugar. Add the eggs, one at a time. Beat in the vinegar, vanilla, baking powder and salt. Stir in the flour and then the nuts by hand. Spread the batter into the pan and bake for approximately 26 minutes. You can have a nice warm treat in under 30 minutes. 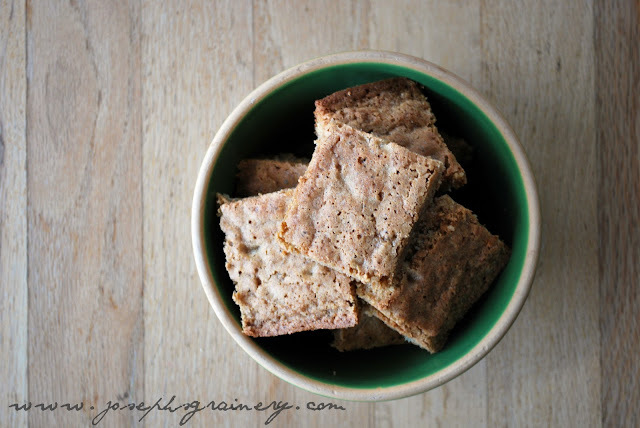 Easy and definitely delicious! These Whole Wheat Blondie Bars were so good I broke this green bowl while reaching for one...MaMa was kinda sad, I may have to get her another green bowl.